NASA's Terra satellite captured this view of the ash plume wafting from Hawaii's Kilauea volcano on May 6, 2018, using its Multi-angle Imaging SpectroRadiometer instrument. The right-hand frame shows the height of the plume. 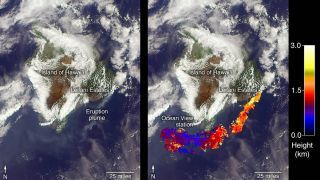 A NASA Earth-observing satellite has given us another view of the volcanic outburst underway on the Big Island of Hawaii. "The top of the plume near the fissure is at approximately 6,500 feet (2,000 meters) altitude, and the height of the plume decreases as it travels south and west," NASA officials wrote yesterday (May 9) in a description of the newly released MISR image. "These relatively low altitudes mean that the ash and sulfur dioxide remained near the ground, which can cause health issues for people on the island downwind of the eruption," they added. Terra also got a good look at that sulfur dioxide, imaging big clouds of it on Sunday using a different instrument called the Advanced Spaceborne Thermal Emission and Reflection Radiometer (ASTER). The ASTER data also revealed "hotspots" on Kilauea — fresh lava flows, as well as a dozen newly formed fissures in the volcano. The current Kilauea outburst has destroyed several dozen structures and impelled Hawaiian authorities to order the evacuation of more than 1,500 people to date. There have been no reports of death or serious injury related to the eruption so far. Terra launched to Earth orbit in December 1999. It keeps tabs on the planet's climate cycle and other large-scale processes, as well as humanity's impact on ecosystems, using ASTER, MISR and three other science instruments.